Using acrylic paints for polymer clay is nothing new, although it certainly has had an uprising with the popularity of silkscreening on polymer clay in recent months. While the majority of acrylic paints can safely be used with polymer clay, I have a few favorites that I go to repeatedly. Golden’s Heavy Body Quinacridone Nickel Azo Gold (Recommended by Laurie Mika) – I use this for “freckles” on faces and to add a warm “flush” to skin tones. It’s transparent, so used sparingly it can add excellent detail. Get it on Amazon. Studio 71 Burnt Sienna – I use this to add depth as a “shadow” for most of my pieces made in a warm tone. I prefer the “red” in this shade to the grey tones of it’s counterpart “raw sienna.” This is my preference, but you can chose which tone you like. Get a similar paint on Amazon. Deco Art Crafter’s Acrylic in Tan – This is great for adding shading to hair. You can even add highlight to cheekbones after baking too. It corresponds delightfully with my Luminescent Skin recipe as well. Get it on Amazon. Deco Art Crafter’s Acrylic in Antique White – I often find that white can be too harsh for many applications. “Antique White” (or “Light Antique White”) make excellent alternatives. Both colors have just a touch of yellow. This helps to help soften the color and not make it so harsh against a skin tone. This allows for a more natural appearance, yet still appears white again flesh tones. Get it on Amazon. 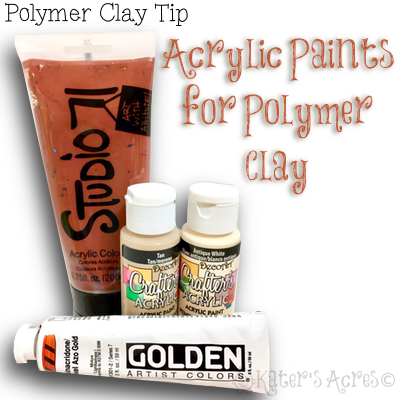 These four acrylic paints for polymer clay are not the only ones that I use in my sculptures. However, these are the colors that I turn to the most often and rely on for the majority of my work. I hope that you find these suggestions helpful for your own sculptures. I have included a gallery where these acrylics were used. See if you can find the paints at work in the faces and sculptures showcased below. Next post: WIP Wednesday’s Back Again!